When summer comes again, I just need to find new light and fresh desserts to use peaches, my favorite fruit. If you are like me, cannot get enough of them, here is another a cool recipe to try. This recipe is quite versatile, you can also saute the peaches in a pan with a little butter and sugar. Personally I love to grill them, I think the flavor stands out more. Also, you can see the rice cream at the bottom of the dish to be a little dark, it’s just because I used coconut sugar which is naturally amber color. You can use regular sugar to get a snow white cream which I think is prettier in the plate. This dessert is also vegan which can be interesting for those who are lactose intolerant but can also be made using regular milk as well. For coconut milk, I used the light one which has 45 calories per servings and that comes in a large paper box, not the one in a can. For the ice cream, I used a vanilla ice cream made with coconut milk that is delicious (usually I don’t like to advertise brands on this blog, but this one is really , on top of it, it has no added sugar, so if you are like me and that you don’t have a sweet tooth and no taste for sugar, this ice cream is perfect. Start by cooking the rice. In a pot, add vanilla bean to milk and bring the mixture to a to a boil at medium temperature. Add rice and sugar and let cook the rice until tender at low temperature. Add milk if necessary and adjust sugar. stir once in a while ensuring the rice does not stick to the pot. When the rice is cooked, let it cool and mix in a blender to obtain a smooth cream. Place in the refrigerator. In the meantime, grill peaches in a skillet or grill pan. Grill on both sides. 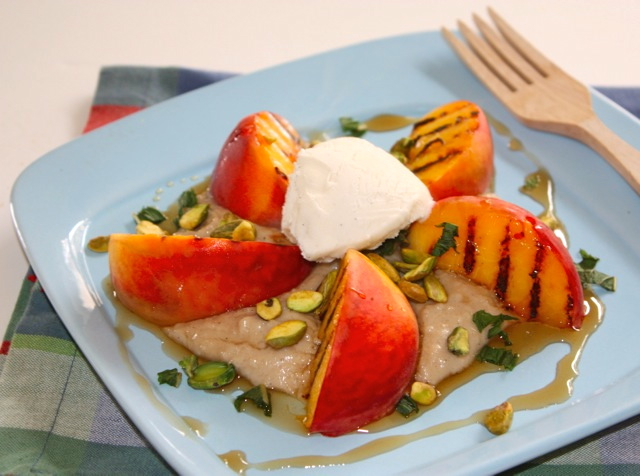 In a plate, place 3 tbs rice cream, top it with grilled peaches. Spoon ice cream in the middle, sprinkle with pistachios and agave nectar. This entry was posted by silvia on June 27, 2014 at 10:36 pm, and is filed under Desserts, Vegan. Follow any responses to this post through RSS 2.0.You can leave a response or trackback from your own site.